As reported by the Athens Geodynamic Institute, a strong earthquake with intensity of 6,1 on the Richter scale occurred at 9:10 am on November 17th 2015, and was felt over half of Greece. The earthquake’s epicenter was at the southwestern cape of Lefkada, 23 kilometers southwest of the city of Lefkada. Disasters occurred in villages at the south of the island, where landslides took place and some houses were demolished causing also two casualties. The earthquake was especially felt from the people on the neighboring islands of Kefalonia and Ithaca, where also considerable landslides took place alongside rural roads causing severe damages. It is thought that this earthquake came from the activation of the fault which gave the devastating earthquakes in Lixouri about one and a half year ago. Over the years, Maccaferri has achieved a highly-appreciated experience and knowledge in land recovery projects following natural disasters. Indeed, Maccaferri was recently involved in a major recovery project in Malaysia, where a whole mountain cliff collapsed over a motorway (link). In Lefkada, especially in the southern and western areas of island, where two women were killed by the earthquake as reported by the Huffington Post, major damages occurred according to the Deputy Head of Lefkada. In multiple villages, houses have been destroyed, fences have collapsed and there are reports of damages to other infrastructures. Harm has also been reported in the ports at the southern cape of Lefkada. Furthermore, to assess the situation, an inspection team from the local authorities has visited the southern part of the island, which seems most affected by the earthquake. Large sections of the provincial road network suffered severe cracks. To date, due to this seismic event, the island of Lefkada has moved thirty-six cm to the south. These are results from measurements of researchers at the National Observatory of Athens, using advanced instruments. The analysis of the data, shows that mentioned ground shift towards Kefalonia is indeed valid. At the same time, images from satellite show that, in addition to horizontal displacement, in some places of Lefkada the earth’s crust has undergone vertical deformation reaching even to 20 cm, when the corresponding sedimentation in Athens after the 1999 earthquake did not exceed 9 cm. In view of the forthcoming opening of touristic season, as Lefkada and its beaches are one of the most popular Greek tourist destination, it is now required that effective solutions may be urgently set in place to rehabilitate the island. 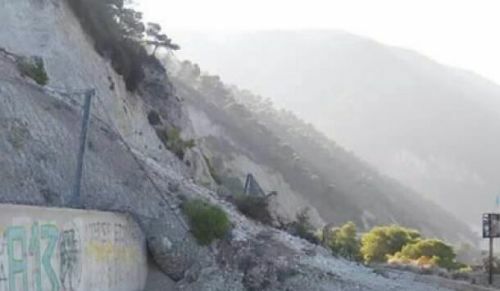 Maccaferri Hellas and its technical staff is in constant contact with the Authorities, in order to offer help, as well as their expertise and experience in rockfall protection, to meet effective and safe solutions for the protection and rehabilitation from natural hazards. In a 2014 earthquake that occurred in the island of Kefalonia, Maccaferri Hellas successfully helped in the recovery of the land by providing a variety of products, which included rockfall barriers and simple drapery applications products such as Steelgrid and HEA Panels. For any inquiry about our know-how to help recover the island of Lefkada, please do not hesitate to contact us.